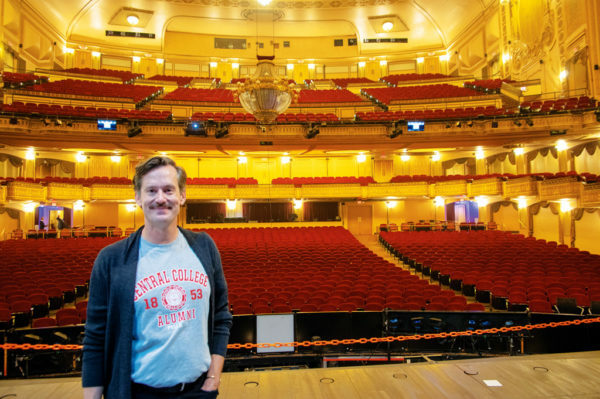 Rob Lindley ’95 wasn’t a standout on the Central College stage. That may be one reason he’s so successful—and so generous-spirited—now. 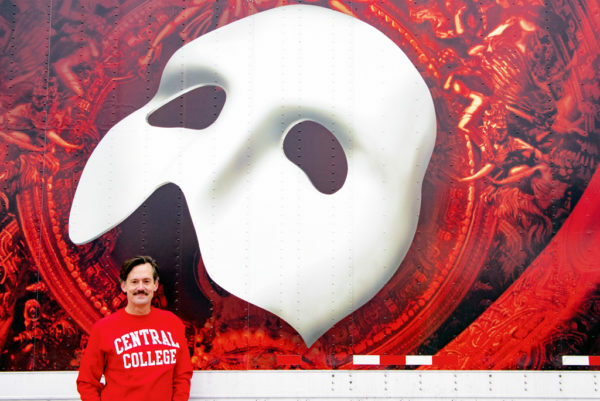 In the nationally touring production of “The Phantom of the Opera,” Rob Lindley ’95 is, in stage parlance, “M-3” or “Male 3:” the third most prominent male actor in the cast. “I’m actually a little bit important,” he says with self-deprecating humor. In fact, his role as Monsieur André—an owner of a haunted theatre—is lynchpin to the plot. He must cope with a vain prima donna who thinks she runs the show. A totalitarian ballet mistress who DOES run the show. A possessed female lead. Plus fickle critics, an overbearing patron—and of course the Phantom, who plagues the whole lot with gothic horror and mayhem. Meanwhile, André desperately, hysterically tries to hold the opera company together. 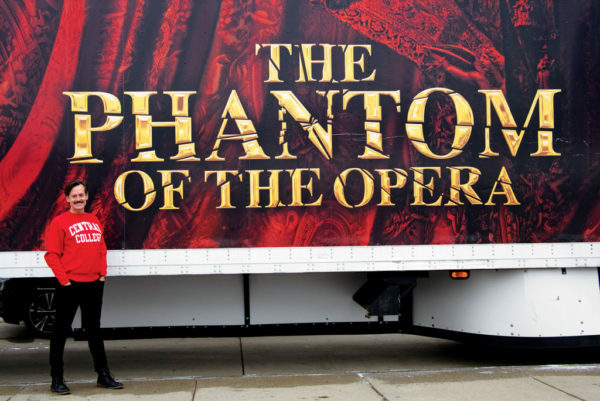 Lindley was in high school and college when “Phantom” originally toured, but he wasn’t initially attracted to the production in spite of his longtime dream of performing in a Broadway show. But when he was asked to audition, the part of André won him over. He sips coffee and muses a bit on the paradox of Rob Lindley playing Gilles André. Lindley grew up the son of a minister in Alta, Iowa, a tiny hamlet of about 500 families in northwest Iowa. He started singing in church at 5; by middle school he was soloing at weddings and funerals. “I was brought up that the ability to sing was a gift from God. If you had it, it was your duty to share it,” he says. He added speech to his repertoire in high school—“one of those great small-town schools where winning speech competitions gave you the same amount of street cred as being a quarterback,” he says. By the time he graduated, he held a school record for the number of all-state speech entries in choral reading and individual categories—double entries every year but one, he recalls. He did learn a lot at Central, but the big fish part came later. He was also an enthusiastic member of the A Cappella Choir. “That was so much fun,” he smiles. 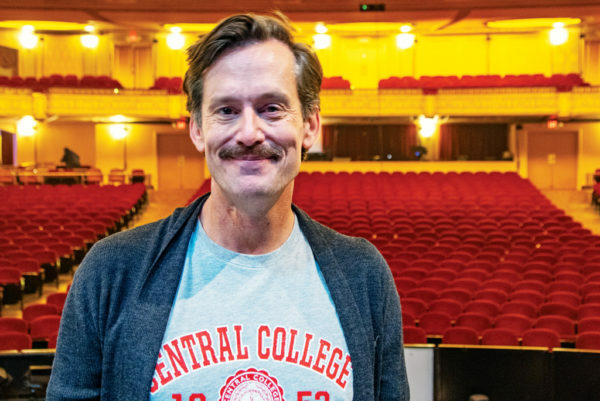 “I met my best friends there and really think Central’s A Cappella Choir takes its place firmly in the Midwest tradition of great college choirs. Honestly, except for a little coaching now and then in professors’ offices, the choir was as much formal vocal training as I’ve ever had. And it has been enough, even for a Broadway tour,” he says. 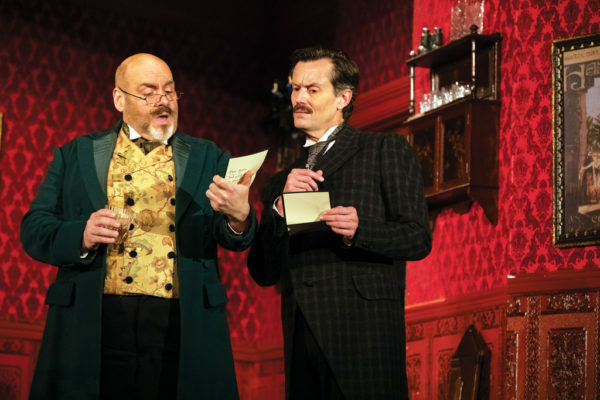 David Benoit as Monsieur Firmin and Rob Lindley as Monsieur André in the spectacular new production of “The Phantom of the Opera.” Photo by Matthew Murphy. That proposition may have helped motivate Lindley to attend a mass audition in Kansas City with a number of fellow Central theatre majors—some of whom he’d lost roles to for years. “I was going mostly as a techie and a timekeeper,” he says, but at the last minute decided to audition as an actor. In 1997 a director told Lindley, “You’re so funny! You should go to Chicago,” where the legendary The Second City company had created a focus for comedy. He’s been in Chicago since. He is a graduate and former instructor at The Second City Training Center and a longtime member of the musical improv ensemble Baby Wants Candy. In Chicago, he’s acted, directed, recorded and taught. 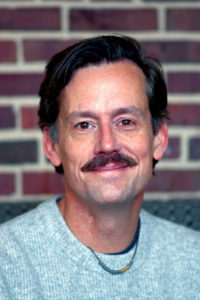 His performances have won him the 2010 Jeff Award for Actor in a Revue for “Oh Coward” at the Writers’ Theatre in Chicago. He was nominated for a 2008 Equity Jeff Award for “Carousel” (opposite Broadway’s Jessie Mueller) and a 2013 Equity Jeff Award for “James Joyce’s ‘The Dead’” at the Court Theatre in Chicago. 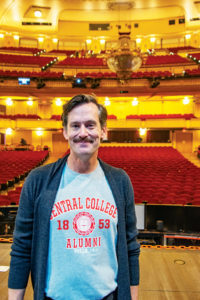 Most recently, he was nominated for another Jeff Award for “Fun Home” at Victory Gardens Theatre and won Best Supporting Actor in a Musical in the 2018 Chicago Theatre Awards presented by The Hawk Chicago. It all led to this, his first nationally touring Broadway role in the most popular musical of all time. The part of Monsieur André is one of a man who earnestly wants for all to go well and for everyone to be happy in spite of overwhelming evidence that things are well out of his control. Lindley performs it with deftness, panache and a deep-yet-comic empathy that seems to come from something far more personal than just a close reading of the script. There is, perhaps, a good deal of Rob Lindley in this Gilles André. And the audience—judging from the laughs and applause he gets—loves him. But the greatest impression you get from Lindley—on stage or off—is that of intense sincerity. That quality inspires one last unscripted question—not about his path, but about his purpose. He answers without a blink, as though it is something that informs everything he does. He continues: “For a while in my life, I wasn’t being fully honest with myself about who I was. I hadn’t come out; I wasn’t standing in my truth. It’s hard to be an actor if your life already has a couple layers of acting on it. You end up presenting something that you just aren’t. But if you are living in the middle of God’s will for you, nothing can touch you. It’s no accident that the summer I came out was the summer I never stopped working again. I am authentic now.